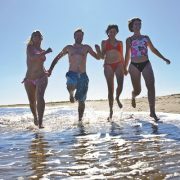 With spring finally here after the long, dreary winter, there’s a good reason to make the most of the early sunshine, aside from the sheer pleasure of feeling it on the skin: to boost the body’s supplies of vitamin D, at low levels in many people by the end of the winter months. Dubbed the ‘sunshine vitamin’ since our bodies can only make it when the skin is exposed to UVB rays, vitamin D is increasingly thought by researchers to have crucial health benefits including a lower risk of chronic disease. You should gently wash your skin in the shower. This gives the UV light the best chance at penetrating the top layers of your skin. Kick-starting that melatonin production. These lotions help you tan faster, moisturise and many help reduce the appearance of fine lines and wrinkles. By supplying your skin with much needed vitamins, minerals, amino acids and moisture, these lotions can help you tan up to 67% better than using no lotion at all. Over-using a sunbed can cause you to burn. Besides being uncomfortable and often painful, this can result in very dry skin often resulting in peeling. If you burn, you should wait at least 48 hours after the redness has gone before going back on any sunbed. Believe it or not, what you eat can significantly affect how well you will tan. A diet high in Vitamin A raise your body’s production of melatonin. The best source of vitamin A is carrots. Selenium and Vitamin E protect the skin from wrinkles: they are contained in eggs, corn, tomatoes, avocado and white cheeses. Fish, almonds and hazelnuts contain omega 3, fundamental to prevent skin ageing. Beta carotene is to be found mainly in fruits and vegetables that are orange and red coloured. Consume vegetables raw or steamed and season them preferably with extra-virgin olive oil, as it helps in absorbing the beta-carotene. Your tanning salon may sell additional products known as tanning supplements. These can come in many form including drinks, tablet and sweets. Most tanning supplements contain the vitamins and minerals to assist your body into producing melatonin. It is even possible to tan using tanning supplements without using a sunbed. 1 – Very fair. The session should be reduced. Tans slowly, if at all. 2 – Fair. Tans with difficulty, tends to burn easily. 3 – Medium. Tans fairly easily, rarely burns. 4 – Olive/Dark. Tans easily, never burns. It probably obvious, if you aren’t tanning very often, then you aren’t going to tan as quickly. It’s important to leave 24-48 hours between tanning sessions, and it’s common for regular tanners to use sunbeds 2-3 times per week. We upgrade and re-tube our sunbeds regularly. 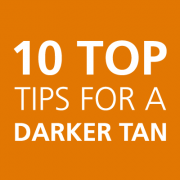 For more advice on using sunbeds, visit The Hot Spot Tanning Salon Plymouth in Plymouth City Centre or email us from the contact page.